Lunch today was a Lamb Wrap, delicious! Lunch today was a lamb wrap: I spread ~60g of cottage cheese on an organic rye, oat and linseed wrap (tortilla will do) then topped with lots of rocket. I cooked 100g of lamb steak and ~40g of mushrooms in a small amount of coconut oil in a frying pan then left to stand on a paper towel to absorb excess oil. Then I cooked an egg in the same frying pan and put it all together. Delicious but oh so messy!! 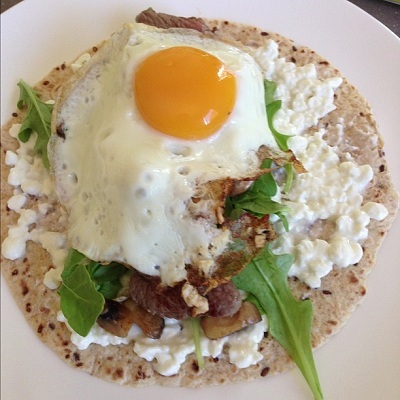 Next time I put an egg in a wrap I'll have to break the yolk when I cook it, so yolk doesn't go everywhere!